I was going to quit this year, finally, and just maintain areas that turned into crazy jungles. Just prune and weed and divide occasionally, do something else with my time in the winter and spring. 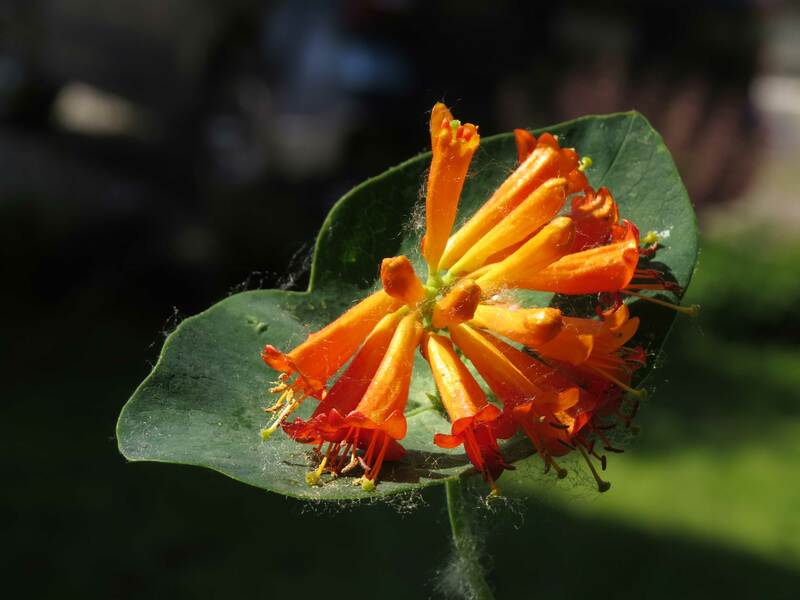 But the orange honeysuckle burst into bloom for the first time in a decade and the Anna’s hummingbirds drink from every flower as it matures from yellow to deep orange. And veritable flocks of Western swallowtail butterflies hang adoringly off the mock orange flowers. Red Admiral butterflies showed up for the first time to lay eggs on the stinging nettle lurking where I can’t get at it, a painted lady butterfly made a first appearance for strawberry flowers, and mourning cloaks basked on the power line and the lawn for over a month. A Lorquin’s admiral defends Now in June, bees work globe mallow flowers, wild lilac, and nodding onion. Flocks of cedar waxwings move from the salmonberry to the twinberry and await the ripening of serviceberry and Oregon grape berries. There are pairs of nesting black-headed grosbeaks, Western tanagers, and Bullock’s orioles, none of which I’ve seen before. Nests are everywhere, with babies crying to be fed. Scent follows me everywhere as I walk past the woodland garden, the sun garden, hedgerows, fruit trees, borders. None of this rich world was here when I arrived fourteen years ago. I made it happen- and I am not even a gardener. 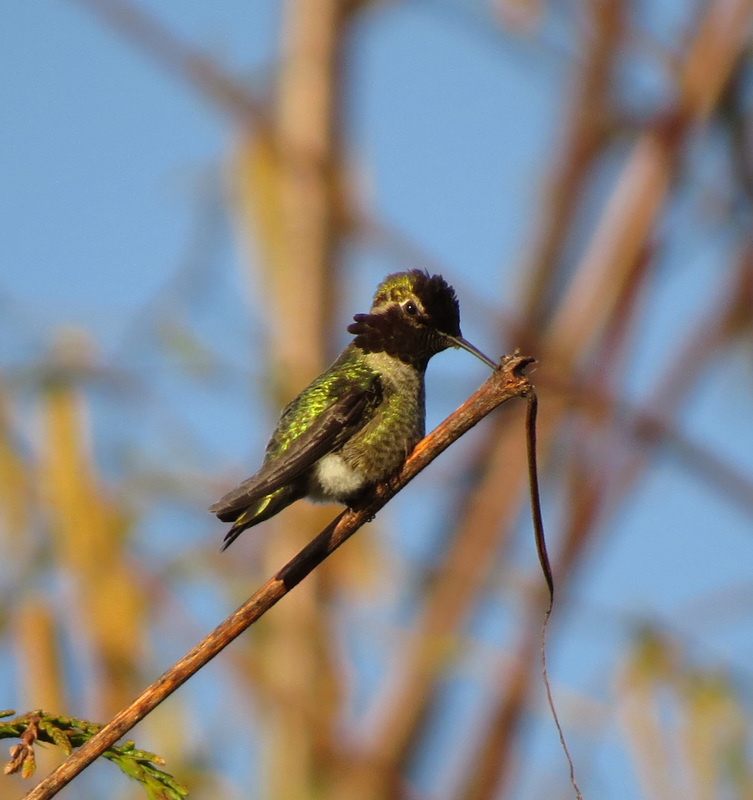 Male Anna’s hummingbird, staking a claim. The mowing began after massive clearing that took place some 70 years ago, long after Dr. Henry Smith made his way up the Snohomish River and decided it would be tamed to create a new Holland. While the river has never agreed to this, and occasionally wipes out everything man puts in its way, the land has changed forever with diking and drainage. The only survivor on my property is a bigleaf maple, now huge in girth, left as a property boundary marker as was the practice throughout the river valley. This tree would have stood as cedar, spruce, willow, crabapple, and maple were felled in the swamps around it, as sediment was dredged to make farmer-engineered dikes that cut off the land from water and nutrients, as a river once seasonally choked with salmon was raked to fill canneries as if there were no tomorrow. The old maple leafs out every year and bears seed still, but the number of giant limbs dropping signals impending demise. I wonder if that tree will breathe a sigh of relief to go to eternal sleep and see no more destruction of the world into which it sprouted. The maple has more company of compatriot plants it once stood beside, along with some fresh faces that better survive the drained condition. When I moved here, it became immediately obvious that I didn’t need so much reed canarygrass, a terrible horse forage due to its fibrous nature and alkaloid content. I needed wind and sun break. Western Washington is not a chronic sheet of drizzle, as people think, but a Mediterranean climate that dries during the summer. Afternoon marine thermals are common in the summer. In the fall and spring, windstorms can brew as low pressure fronts arrive. All this wind comes pretty much straight at my property from Fobes Hill. The hill returns the favor by deflecting weather, but that means my ground is drier as a result. The afternoon sun would bake my horses and heat up the barn so that bringing them inside just meant they would sweat instead of burn. So my neighbor, the grant administrator for the Snohomish Conservation District, encouraged me to check out their annual bareroot plant sale. Since then, I have spent an average of $300/year on plants that cost $1 apiece, and frequently come home with sale plants or needy homeless plants. I was told to plant dense, that half the plants would die. I was told to bring in better soil for planting, to use compost and mulch. 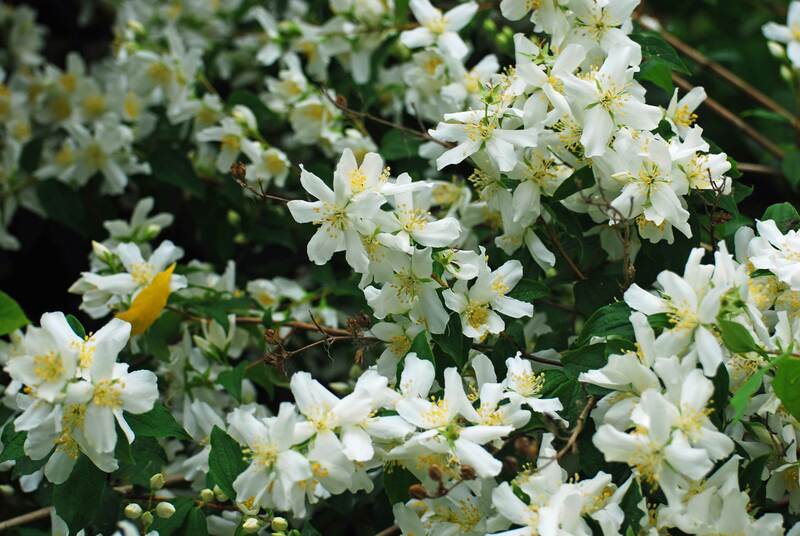 Mock orange, more frequent in Eastern Washington, with nectar for butterflies and seeds for birds- and citrus scent for people! And then most of the plants decided life was worth living. 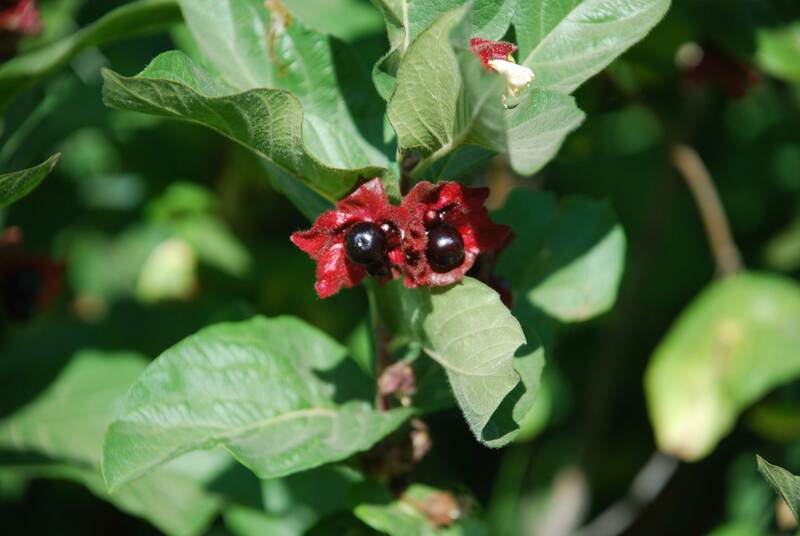 They cheerfully suckered, layered their branches as they marched across the land, sent out runners, produced berries and seeds for birds to poop out and start new plants elsewhere. It is a sad day when you’re relieved the pesky beaver has wandered into the yard and nabbed a shore pine you never should have planted in that location. Equally sad is the day you uncover dead trees girdled by voles and thank the voles for being such good owl snacks and saving you from your over-planting along the way. There are always new areas to plant, however, and the birds and butterflies egg me on. Fencing in this area, with our high water table, either rots or rusts;as farmers in medieval England discovered, hedgerows planted along fencing create the same animal barriers with less maintenance, and they provide wildlife benefit. And the earthen dike needs more root mass and fewer Himalayan blackberries, so there is always space there. The real truth of the matter is that wearing out gloves, boots and jeans whether it’s sunny or raining has not just attracted wildlife, fostered life and protected water quality: it’s also kept me sane. I work with the public in an activist West Coast urban center known for its addiction to process, and sometimes want to run screaming from the complexity of the human race. And then I come home, dig in the dirt, plant the next phase of jungle, and watch the world come alive in the spring with animals that are happy simply with a food source, shelter and a safe place to start a family. It’s a good balance for me.